The It Takes A World campaign in the UK focuses on campaigning to end violence against children in humanitarian contexts, and its launch highlights the issue of children in armed groups. To support the It Takes A World campaign launch, World Vision UK has partnered with children around the world to create a research report, entitled “Their Fight, Our Future". We chose this name because around 250 million children and young people live in countries affected by armed conflicts: conflicts they did not create, conflicts in which they have no say, conflicts which are destroying their childhoods. Today - the day before the 29th Anniversary of the UN Convention on the Right of the Child - young people from the UK who were involved in the report will meet MPs. They will explain why it is important for them to promote the voices of those children who have been involved in armed forces and groups, and urge them to help put an end to violence against children in emergencies. The aim of this research was to create a space for children and young people to discuss the plight of children in armed groups. We collected four stories of children who were recruited as child soldiers from the Democratic Republic of Congo (DRC) and South Sudan. These stories were used to provide an opportunity for a wider group of children and young people to voice their comments and give their recommendations to the UK Government. Sixty-one children and young people contributed, aged between 13 and 22. These children were active members of World Vision Young Leaders Programme (Ethiopia, Bangladesh, Sri Lanka), World Vision Peace Clubs (Kenya, West Nile Response Uganda, Central African Republic) and existing UK youth groups (British Youth Council and Restless Development). During the focus group discussions, children and young people shared how they felt about the stories and what messages they’d like to send to the UK Government. We want to give young people who are not directly affected by armed conflict a space to express themselves and stand with their peers, for the rights of the most disadvantaged children such as child soldiers. We also want to give a platform to former child soldiers to share their thoughts. 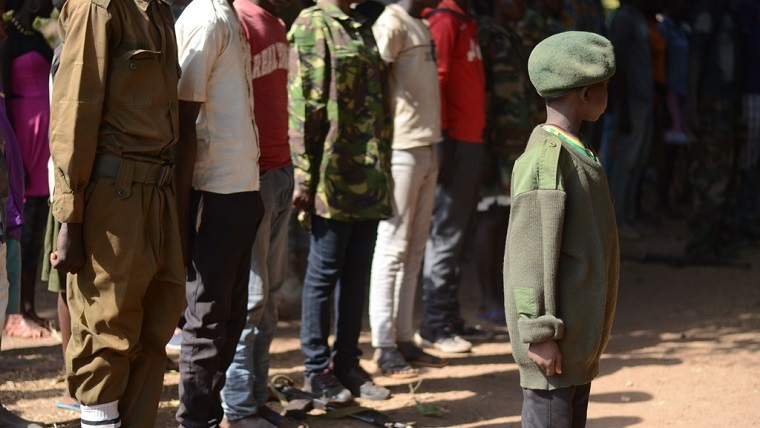 As mentioned by Kabila, aged 13, from the Central African Republic: "Former child soldiers are the best solution to sensitise other children to not join any more or not to be enlisted by the armed groups. Mr. Michel Forst, the UN Special Rapporteur on the Situation of Human Rights Defenders in Geneva, gave his support to this initiative by writing the foreword of the report. He reinforces that anyone who acts at any moment, for any human right is a human rights defender. With this report, he said that together we are creating a global movement for children and young people as human rights defenders. Click here to read the Their Fight, Our Future report.